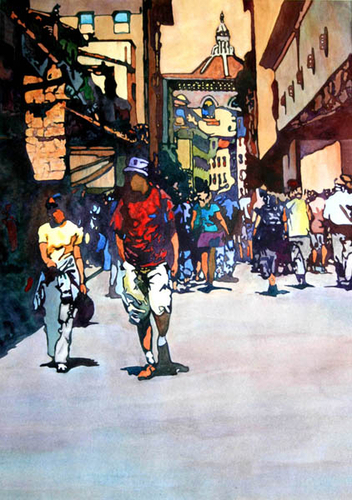 Going to the Duomo, Original Watercolor of tourists in Florence, Italy going to and from the Duomo. The brightness of the painting was achieved by using brilliant colors surrounded by duller, dark shapes. A feeling of a bright day in one of Florences, cobbled stone, pedestrianized streets. As I painted this I could recall the atmosphere, the warmness of Florence, the sounds of musicians in the piazzas the enticing smells of lunch cooking in an array of wonderful restaurants. My favorite city. Hope it shows in this painting. The size you see here is image size. The price of the original painting includes off-white cotton rag mat, cotton rag foam core backing, ready to insert in the frame of your choice.